We are pleased to announce to introduction of new LED luminaires into our Luxace range! Create striking impressions and innovative lighting designs with our Luxace luminaires, these products are capable of elevating a space from the ordinary to the extraordinary. Our decorative range of luminaires lend themselves to contract feature lighting in both internal and external projects, for example: bars, hotels and exterior passageways. With our contemporary Luxace products the possibilities are endless with suspended and surface mounted solutions available in a number configurations. Additionally a selection of these luminaires are compatible with intelligent lighting controls such as 3 hour integral emergency, 1-10V and DALI dimming. 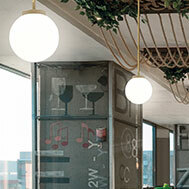 If you are involved in any projects which may require decorative lighting please don’t hesitate to contact us.